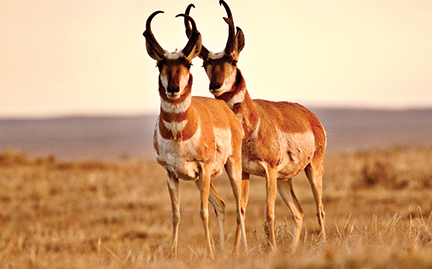 Reaching speeds of up to 53 mph, the pronghorn is the fastest hoofed animal in North America and second only to the cheetah as the fastest animal on land. This swift-moving prairie dweller requires wide expanses of prairie each season, covering up to 200 miles. Caribou are the only North American land animal species with a longer migration distance. This unique behavior makes the pronghorn the model for assessing the impact of human activities that fragment precious prairie land.